New York Times staff editor and writer Bari Weiss moderates a conversation with Stanford historian Steven J. Zipperstein, and New York Times deputy Washington editor Jonathan Weisman. This impromptu gathering of the concerned will be hosted by Atina Grossmann, Professor of History, The Cooper Union. On the 115th anniversary of the Russian pogrom that shocked the world and unleashed the forces that would shape the 20th century, we're gathering in the hall where Anna Strunsky drew the connection between Russian and American violence against Jews and Blacks, to reflect on the nativist and religion-fueled judeophobia that refuses to die. Recently singled out for praise by Philip Roth in the New York Times Sunday Book Review, Steven J. Zipperstein’s new book “POGROM: KISHINEV AND THE TILT OF HISTORY” shows how a riot that broke out in a dusty, backwater town in late-Tsarist Russia became the Big Bang of the 20th century. Detonated by fake news and amplified by a mix of politics, poetry, immigration and modern media, this otherwise unremarkable savaging of Russian Jews lent disproportional and crucial impetus to movements as far flung as the Russian Revolution, Zionism, the Jewish-American Left and the NAACP. An epic American immigrant story it arrives at a watershed moment in the national conversation about refugees. The story of the Kishinev pogrom is also a useful reminder that fake news, conspiracy theories and rumor-mongering did not begin with Twitter and Facebook. At a time when public outrage is once again focused on treatment of refugees, violence against women, and state-enabled anti-Semitism, The New York Times’ Jonathan Weisman draws a straight line from the xenophobia and anti-Semitism of the early twentieth century to today. His new book ((( SEMITISM)) Being Jewish in the Age of Trump explores the disconnect between his own sense of Jewish identity and the expectations of his detractors and supporters. He delves into the rise of the Alt Right, their roots in older anti-Semitic organizations, the odd ancientness of their grievances―cloaked as they are in contemporary, techy hipsterism―and their aims―to spread hate in a palatable way through a political structure that has so suddenly become tolerant of their views. He concludes with what we should do next, realizing that vicious as it is, anti-Semitism must be seen through the lens of more pressing threats. He proposes a unification of American Judaism around the defense of self and of others even more vulnerable: the undocumented immigrants, refugees, Muslim Americans, and black activists who have been directly targeted. 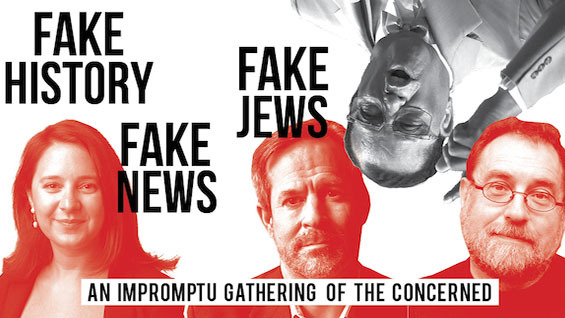 The event, which is free and open to the public, is co-presented by BMM Worldwide, W. W. Norton & Co/Liveright Publishing and St. Martin's Press in association with The Cooper Union, the Jewish Book Council, and YIVO Institute for Jewish Research.